The job characteristics model (JCM) is a normative approach to job redesigning and enrichment in organizations. Two organizational psychologists designed this model; Greg Oldham and J. Richard Hackman. 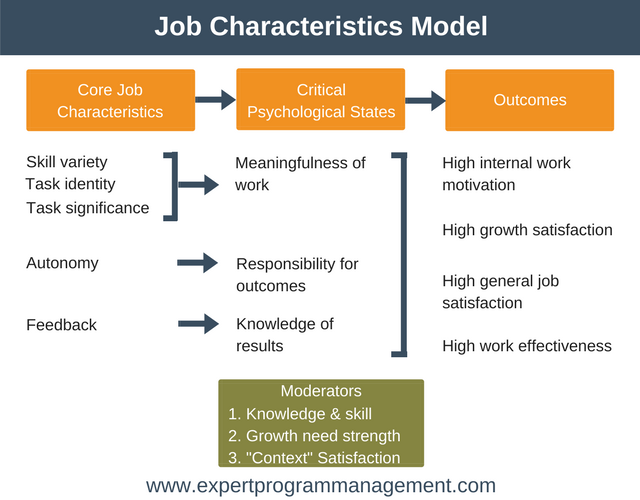 The job characteristics model explicitly states the five core dimensions of work that can result in critical psychological states in individual employees. The dimensions named above play a role to the meaningfulness of the work. Therefore, work is made more meaningful to the employee if the task significance, identity, and variety are higher than before. Autonomy is the fourth job dimension. Autonomy refers to the extent of freedom, and discretion employees have over their tasks. The greater the freedom, the more employees feel responsible for the outcome of their work. The last dimension is feedback, which refers to the extent to which the job provides employees with information about the effectiveness of their performance. Feedback allows employees to appreciate results of their efforts. The job characteristic model recommends that positive psychological states will yield positive outcomes for individual employees as well as the whole organization. It will also enhance high-quality performance, low absenteeism, high motivation, low labor turnover and high job satisfaction ("Job Characteristics Model - Oxford Reference", 2016). i. Responsibility – Abundant freedom of action supplied to an employee gives them an opportunity to be a success or failure at their job. They are also able to incorporate new skills and make changes while doing the job. iii. Knowledge of outcomes- First, it provides employees with knowledge of how successful their job was so as they can learn from mistakes. Second, it connects them to consumers of their output which gives them a further purpose to their work. i. Assigning jobs to groups so as to multiply the wholeness of deliverables produced and allow organizations to enhance significance. iii. Communicate outcomes to workers and connect them to customers of their end products so that they can get feedback and learn from it. iv. Delegating a task to its lowest level so as to create autonomy hence responsibility.